I’m pleased to announce that we have received 510(k) clearance for the ASAPLP Low Profile Aspiration Catheter, a new low-profile addition to our ASAP® line of aspiration catheters. The ASAPLP received the CE mark on August 30. The ASAPLP is designed to remove fresh, soft emboli and thrombi from vessels of the arterial system. ASAPLP is Merit Medical’s latest innovation for quick, effective aspiration! For more information on the ASAP line of aspiration catheters, see the the Aspiration Catheter Family Brochure. Cynthia Bailey revealed that she had fibroids in last week’s episode of the Real Housewives of Atlanta. Cynthia complained of heavy bleeding and long menstrual periods and the toll it was taking on her body and her personal life. On the episode, set to air on Sunday, November 17 at 8 PM Eastern time, the cameras will be present when Cynthia undergoes a uterine fibroid embolization (UFE) procedure. Cynthia described the results of her UFE procedure in a recent interview as “life changing.” “Everything has changed and it has been amazing. I’m so glad I took care of it.” She said that she decided to share this experience to promote public awareness of uterine fibroids. Uterine fibroids affect millions of women between the ages of 20 and 50 and are more common in African American women. Bailey hopes that fans will be inspired by her story. Merit Medical sponsors an informational resource, the ask4UFE.com website, devoted to educating women about fibroids, treatment options, and UFE. The website includes a Physician Locator Tool to help women find physicians in their area who perform the UFE procedure. Merit Medical also offers embolization products that are used in uterine fibroid embolization (UFE) procedures: Embosphere® Microspheres and Bearing nsPVA™ nonspherical polyvinyl alcohol embolization particles. UFE is a less invasive treatment than hysterectomy. Go to http://www.ask4UFE.com today to determine if UFE is the right treatment option for you. Comparison of Radiofrequency-targeted Vertebral Augmentation with Balloon Kyphoplasty for the Treatment of Vertebral Compression Fractures: 2-year Results. https://www.merit.com/wp-content/uploads/2018/11/merit-header-logo.svg 0 0 meritemea https://www.merit.com/wp-content/uploads/2018/11/merit-header-logo.svg meritemea2013-11-15 00:00:002018-07-16 11:33:06Comparison of Radiofrequency-targeted Vertebral Augmentation with Balloon Kyphoplasty for the Treatment of Vertebral Compression Fractures: 2-year Results. I’m excited about the recent announcement of Merit Medical’s acquisition of the Safeguard® products for assisting hemostasis. 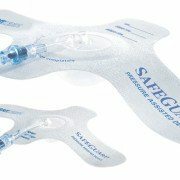 The Safeguard 12 cm and 24 cm Pressure Assisted Devices are latex-free, self-adhesive dressings designed to assist in obtaining and maintaining hemostasis. The 24-cm device is also indicated in the reduction of active compression time in femoral artery cannulation following diagnostic and interventional procedures with an ACT of 140 seconds or less, using a 6 F and smaller sheath size. Merit Medical’s growing portfolio of hemostasis products now includes the Safeguard, the Finale® and the RADstat® Radial Compression Devices and the Clo-Sur PLUS P.A.D.™ Antimicrobial Barrier. 1 Roberts, A et al. Safeguard Manual Assist Technique: The SMAT Study. Cath Lab Digest, June 2008:38. I am pleased to announce that Nippon Kayaku (authorized distributor for Merit Medical Systems, Inc.) has received distribution and marketing authorization in Japan for Embosphere Microspheres and HepaSphere Microspheres. The Japan Ministry of Health, Labour and Welfare held the “10th Investigative Commission about Expedited Introduction of Medical Devices, Which Are Strongly Needed in Medical Treatment” and it recommended the introduction of Embosphere and HepaSphere Microspheres to the Japan market. The recommendation was fulfilled by approval of both products in June 2013. Embosphere Microspheres, the most clinically studied round embolic, provide consistent and predictable results for effective embolization in the treatment of uterine fibroids, hypervascular tumors, and arteriovenous malformations. Used worldwide in over 250,000 procedures since 2002, Embosphere Microspheres are the gold standard in uterine fibroid embolization, with Interventional Radiologists choosing Embosphere Microspheres in 73% of cases according to the FIBROID registry published in Obstetrics and Gynecology. Did you know that there are minimally-invasive treatment options available to treat uterine fibroids and the common symptoms associated with them: heavy bleeding, pelvic pain, and frequent urination? In 2008, Uterine Fibroid Embolization (UFE) was recognized by the American College of Obstetricians and Gynecologists (ACOG) as an alternative to hysterectomy in the management of uterine fibroids. UFE is a proven, effective option for treating uterine fibroids. To learn more about your options, go to www.ask4ufe.com. Merit Medical’s 35 ATM basixTOUCH Inflation Device is now available in the U.S., Europe, and many other countries around the world. The basixTOUCH is the latest innovation in inflation from Merit, and offers 35 ATM pressure capability as well as 30 mL of syringe volume to make it easier to accommodate a wide array of interventional balloons. We surveyed hundreds of physicians and techs, and found a strong desire for a device that was easy on the hands, quick to set up, easy to inflate, and fast to deflate. From this feedback, Merit has designed a device with one-handed prep, an easy-to-turn quick-release handle. The basixTOUCH expands your capacity with the innovation, quality, and reliability that Merit customers have enjoyed for over 25 years. To learn more about this new product and other products supporting interventional and diagnostic procedures, please contact your local Merit Sales Representative or visit us at www.merit.com. SAN JOSE, Calif., Sept. 12, 2013 — DFINE, Inc., a fast-growing market leader in the treatment of spinal diseases, today announced it has received CE Mark approval for the STAR™ Tumor Ablation System for treatment of painful metastatic spinal tumors. The company will launch the STAR System in Europe at the Cardiovascular and Interventional Radiological Society of Europe (CIRSE) Annual Congress (Booth #12). CIRSE, the world’s largest and most prestigious conference in the field of minimally invasive image-guided therapies, will be held in Barcelona, Spain Sept. 14 – 19, 2013. The STAR System received 510k clearance in the United States in August 2010 and has demonstrated strong clinical outcomes at centers across the country. “We are very excited to bring this new treatment modality to Europe so that the hundreds of thousands of patients suffering from painful spinal tumors can receive the rapid pain relief that patients here in the U.S. have experienced. This represents a significant milestone for the company,” said Greg Barrett, Chief Executive Officer of DFINE. Patients suffering from painful spinal tumors have limited options. Many are in excruciating pain and unable to perform activities of daily living. Targeted RF ablation (t-RFA) with the STAR Tumor Ablation System was developed specifically for metastatic vertebral body tumors. The physician can target precisely where the device’s energy is delivered to heat and destroy the tumor, providing rapid and lasting pain relief in a single treatment. 2 Medscape Reference: Victor Tse, MD, PhD; Chief Editor: Stephen A Berman, MD, PhD, MBA, et al. DFINE is dedicated to relieving pain and improving the quality of life for patients suffering from spinal diseases through innovative, minimally invasive therapies. The company’s flagship products, the StabiliT® Vertebral Augmentation System and STAR™ Tumor Ablation System, represent generational advancements in the minimally invasive treatment of spinal diseases. DFINE is based in San Jose, Calif. and is a privately held company. DFINE and StabiliT are registered trademarks and STAR and Targeted Radiofrequency Ablation (t-RFA) are trademarks of DFINE, Inc.
I’m happy to announce the expansion of Merit Medical’s Prelude Radial Sheath Introducer product family. The 4F-6F product line now includes 7F sheaths for radial, brachial and femoral access. 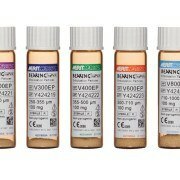 The new 7F sheaths are available in lengths of 7 cm, 11 cm and 23 cm; all kits include an 0.018” guide wire and 21G Merit Advance® angiographic needle. The Prelude Sheath introducers provide excellent transitions for easy and smooth access to your patient. Custom kits including the sheaths can be designed to meet your specific needs. Merit Medical is committed to providing excellent quality products for your access needs. To learn more about this new product and other products, please contact your local Merit Sales Representative or visit us at www.merit.com. We are pleased to introduce Bearing nsPVA Embolization Particles, the latest addition to Merit Medical’s broad array of interventional radiology embolization options. Merit Medical has been the market leader in spherical embolics (Embosphere® Microspheres) for over a decade and Bearing nsPVA will round out Merit’s embolization portfolio with an economical and nonspherical option. Merit’s established tradition for using state-of-the-art equipment and manufacturing processes has enabled us to develop this new product that offers enhancements over existing products in the current market. Bearing nsPVA Embolization Particles are irregularly-shaped, biocompatible, hydrophilic, nonresorbable particles produced from polyvinyl alcohol. These embolization particles are intended to provide vascular occlusion or reduction of blood flow within target vessels upon selective placement through a variety of catheters. Bearing nsPVA is indicated for arteriovenous malformations, hypervascular tumors, and symptomatic uterine fibroids. We look forward to Bearing nsPVA leading the way to targeted embolization. 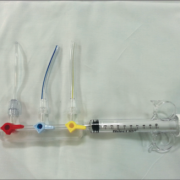 In the article, a custom Merit Medical Fluid Management Kit was pictured showing a modified construction that allows physicians to inject medication while keeping the system closed during angiography, thus reducing the risk of air embolism associated with syringe exchanges. 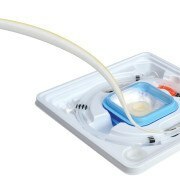 Photo of Merit Medical fluid management products in the configuration suggested in the article. 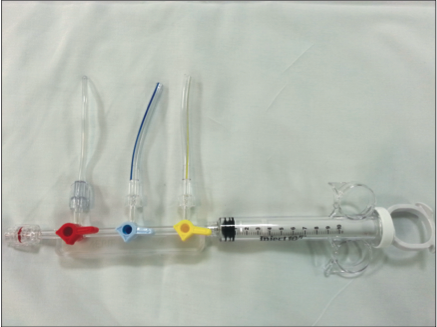 By inserting a 3-way stopcock with pigtail attached to a 5 mL syringe on the heparin flush line, the operator can inject medication through the heparin flush line into the arterial circulation without exchanging the syringe from the manifold. Click on the following link to watch our Fluid Management System & Custom Designed Kits video. 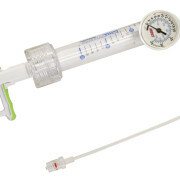 To find out how to get this custom fluid management kit, contact a Merit Medical Representative today! 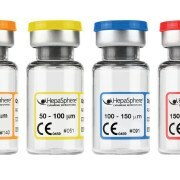 I am pleased to share that we have received the CE Mark for HepaSphere Microspheres’ newly developed 30-60 micron size. The new smaller size provides physicians with the ability to achieve more distal occlusions when embolizing hypervascular tumors and arteriovenous malformations. When packaged in their dry state, the new size microspheres measure 30-60 microns, but when reconstituted for use, they expand to 120-240 microns. HepaSphere Microspheres are biocompatible, hydrophilic, non-resorbable, and conformable microspheres designed for controlled, targeted embolization. HepaSphere Microspheres also rapidly absorb aqueous solutions such as contrast media, saline, or doxorubicin HCI. HepaSphere Microspheres 30-60 micron size, along with the currently available sizes, further enable physicians to optimize outcomes by more precisely matching the sphere size to the size of the targeted vasculature. I am delighted to bring this new smaller size to the market together with a broad line of Interventional Radiology implant options designed to help physicians offer the best possible patient care. 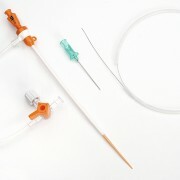 Merit Medical announces the release of its MIV Radial Ventriculogram Catheters. This pigtail catheter is designed to angle toward the left cusp from the radial approach, facilitating easier insertion into the ventricle. The catheter is available in two tip lengths (short and long) and is available in 4F, 5F, and 6F with lengths of 110 cm and 125 cm. To learn more about this new design, contact your local Merit Sales Representative or visit us at www.merit.com. Discover a new era in hydrophilic guide wires at the 2013 Society of Interventional Radiology (SIR) meeting in New Orleans April 13-18. Merit’s Laureate Discovery Hands-On Demonstration Models allow the clinician to experience the real meaning of true 1:1 torque as guide wires are manipulated through tortuous anatomy in a vascular model. While attending SIR this year, please stop by Merit’s booth #1831, and familiarize yourself with the Laureate Hydrophilic Guide Wire to experience unparalleled torque control at your fingertips. Watch the Merit Laureate product video to view an actual torque demonstration with the competition. See the new Merit Laureate brochure. I’m pleased to announce that we will be offering a 0.038” diameter Merit Laureate Hydrophilic Guide Wire worldwide. The increased diameter size will provide additional support options for physicians. Additional support is often required for very tortuous vasculature or when devices requiring additional support are used during procedures. Available in 0.035” to 0.038” diameters, 80 cm to 260 cm lengths, standard and stiff body, with angled and straight tip configurations. Click here to watch our Merit Laureate Product Demonstration Video with side-by-side comparison to the market leader and a product feature animation. Top ten lists are a great way to learn what’s on people’s minds, and at Merit Medical, we learned a lot by reviewing the top ten most-watched product videos in 2012. Over 24,000 viewers took interest in Embosphere® and HepaSphere™–our microsphere embolization products. 23,000 watched videos for ProGuide™ Chronic Dialysis Catheters. Rounding out the top ten were the EN Snare® Endovascular Snare System, the ASAP® Aspiration Catheter, and the ReSolve® line of drainage catheters. There were over 3,000 views of the Great Product, Great People, Great Company video about Merit Medical Systems facilities and capabilities. We hope viewers will continue to watch our videos or visit our website, www.merit.com, to see even more product videos that will be released in 2013.